Award winning 3 years in a row, Steelmate bring you a great looking and functioning parking detector system. The 4 Sensor bumper flush mount reversing system gives you both great distance judging and great corner coverage for all suitable vehicles. The principle in which they work is, when you engage reverse gear the system switches on and will give you a bleep to let you know it is active. It will then slowly bleep when an obstacle comes within around 1.5M or (5ft), the bleeps will then speed up to indicate when the obstacle becomes closer until it goes to a constant tone to indicate that you should not reverse anymore. The sensors come in Matt Black, Gloss Black or Silver but they can be colour matched at an additional cost, please supply your vehicle paint code at time of order. 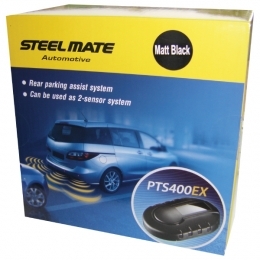 Steelmate PTS400EX Fully fitted reverse parking sensors - audio only.